So, I put on these shorts for the first time since I wore them when I was super pregnant. (I think this pic is from the week before Ramona's due date. As you can see, they're crazy tight. Why I thought I should wear booty shorts when I was nine months pregnant is a question I can't even answer. Oh wait. It was hot. That's the same reason I wore them this weekend.) As soon as I put them on, I commented on how the last time I put them on the waist band was ready to explode with baby. Joe was like, "I wonder if you and Ramona can both fit in there now that she's big." Answer: We can, but it's a little awkward. Joe thought this was the most hilarious thing ever (hence the picture) and kept calling me mama kangaroo and Ramona my joey. I guess it proves I've lost all the baby weight. And the picture proves I really needed to clean the living room. I did, don't worry. One thing I deal with in Death Valley that I never dealt with in Ohio is lizards. I once saw a newt at summer camp, but I didn't have any problems with it. Here, we get the occasional lizard in the house, and the cats freak out and chase it and that's it. Today we got two lizards in the house and I really can't blame them for coming in to try to get out of the heat. It was 127 degrees today, and even in the house with both air conditioners going it was unbelievably hot. But the grossest lizard thing to happen also was this morning. Joe was changing the oil in the car, so I started cleaning the house and went outside to throw a load of laundry in the washer. I had Mony with me since Joe was busy, and she was getting into everything and making a mess so I wasn't paying attention to what I was doing. I threw a bunch of clothes in and started the washer. Joe came in the house and I told him I had started laundry. "Oh, did you take the dead lizard out of the washer?" Um, no? "Yeah, I saw there was a dead lizard in there last week when I moved the clothes into the dryer." This raised questions such as 'why would you leave a dead lizard in the washer when it's a hundred twenty some degrees outside for an entire WEEK', but I didn't get into it. I just told him I didn't notice the lizard so it must still be in there. Well, obviously, I didn't want to deal with the aftermath of a dead lizard in the washer, and since it was kind of Joe's fault for not getting rid of it in the first place, I let Joe take over the laundry and cleaned the kitchen instead. He didn't find it in the washer or dryer, so his theory is that the lizard wasn't dead when he saw it last week and ran away at some point. I'm not sure if I buy that. I don't know if a lizard could even get out of the washer. It's a top loader. But I'm not going to argue. I just hope I don't find a dead lizard in my clothes when I'm getting dressed this week. I forgot to post this earlier. Mony figured out how to make d sounds on Father's Day, so she said "dada" for the first time. Obviously just babbling, but still pretty cute. There are two breweries we're definitely hitting- Coronado Brewing Company and Stone Brewing Company. If we can convince Erin to baby sit one night, we might go to San Diego Brewing as well. We're going to the zoo and Sea World and my friend Kris that used to live in San Diego suggested Ocean Beach. He said La Jolla is really pretty but probably will be super crowded. So we might go there if we get up early, but will probably go to Ocean Beach otherwise. I bought Ramona a new swimsuit and we bought some beach towels and a bucket and shovels. I can't wait for this trip. I am also really pumped to hang out with Erin because we haven't got to spend very much time together over the past couple of years with my living so far away and her being too young to come visit me. Now that she's 15 she can fly alone, so it's pretty cool that she'll be able to come out here and go on a sweet vacation with us. Now I just have to stay patient until trip time. Move back to the midwest- this is pretty self explanatory. I really want to move closer to my family and friends and get back into "the real world" for awhile. Get married- I will probably do a long post going into the whole marriage deal in the near future, but it is something that I'd like to do. Have another baby- We want at least two kids and I'd like to have them pretty close in age, so hopefully we'll have another one in the next couple years. Finish the Brew Blanket- I still have 30-some shirts to go, but I can do it! Run a half marathon in less than 2 hours 45 minutes- Honestly, that's pretty slow, and I know I can do it if I actually train for once. Joe thinks I can do better than 2 hours 30 minutes, but I'll stick with my more realistic goal for now. Do a chin up- This is really dumb, but I've never done a chin up in my life. I have pretty much no upper body strength. I'd really like to do it to prove to myself that I can. Go ice skating- I've just never gone ice skating and I want to try it. It's not much of a challenge, but it's something I want to do. Cruise the Caribbean- I've always wanted to go to the Caribbean, and for some reason I've always wanted to go on a cruise. I like the idea you get to pretty much hang out at a hotel that takes you to interesting places. Go to Denver- I think it looks cool. There's a ton of microbreweries and I could take Joe skiing. he's never been so I think it would be fun. Eat lobster in Maine- I like lobster, and I think Maine looks super beautiful. Become CPA certified- I'm not positive this is something I'm going to do, but I think it would be a good idea to at least look into. Work on my French skills/possibly Spanish- Nothing wrong with some foreign language skills. So that's it. Hopefully 31 year old Megan can look back on this list and say, "I did it all! I'm awesome!" And maybe I'll finish this all and get started on some new goals. She cut her fifth tooth today. She's been eating a lot of new foods lately. All kinds of new excitement. I got my new crown placed and got some insanely painful deep cleaning on half my mouth today. Ramona hung out in the waiting room with her daddy and made tons of new friends. She was also called the cutest baby ever by a total stranger. Just in case you thought it was just me being biased. I bought a plane ticket for Erin to come visit next month, and we're prepping for our trip to San Diego while she's out here. I'm super pumped Not just because we'll get to lounge on the beach and go to one of the best zoos in the world, but because I won't be at work. Everyone can use a break from the daily grind now and then, and I'm definitely not immune. Life is going as well as it can given our current circumstances, and all thing considered we are blessed with jobs and security and the ability to spend time together as a family. But it's still nice to get out and do something new and freeing every once in awhile. I'm looking forward to fireworks in a couple of weeks as I take my little girl to see them for the first time. It's crazy to think that a mere year ago, Joe and I were standing on the strip watching the fireworks while baby fish kicked me in the ribs. Now she is the smiling ball of wonders that brings bursts of pride and happiness in my life on a daily basis. I wanted to go to Boulder City for the fireworks, but they're doing their show on Sunday night. We want to catch a Saturday night show, so it looks like we'll be going to North Las Vegas. I'm hoping it goes well. There is a good chance Ramona will have passed out by fireworks time, but I'm curious to see how she reacts if she's awake. This past weekend we went to Vegas and got some stuff for our San Diego trip and went to one of the brewpubs to get a new shirt for the Brew Blanket. It was Ramona's first brewpub and she did awesome! The food was really good and Ramona tasted some of the toast and a little bit of artichoke dip. She was such a good baby and totally showed up the fussy baby that was there. One of the waitresses asked, "Doesn't it make you so thankful for your baby when you hear another baby fussing?" And I told her, "Yes, I'm thankful it's not us this time." Ramona has never been the fussy baby when we've been out, but I know damn well that she could be. Luck and my awesome powers of distraction have been on our side thus far, but easily could not be at some time in the future. So I am one hundred percent thankful for every time she is charming and adorable when we're in public. San Diego will be a big test for her. It will be a lot of being out in the world and seeing lots of people. Hopefully we'll keep meltdowns to a minimal. But I'm super excited and feel like I'm just biding my time until my baby sister comes to hang out with my baby girl. There's only a few weeks until she gets out here and I'm obsessively planning and consulting everyone I know on what we should do while in San Diego. Father's Day was pretty low key. We hung out at home and I actually cooked for Joe. Joe is the cook in our family, so me cooking was a pretty big deal. I made lobster rolls and clam chowder. It was super yummy if I do say so myself, and Joe said my lobster rolls were the best sandwich he's ever had. Score! The entire weekend was really great for me, and I think Joe enjoyed it as well. I made him the video I put in my last post, but the best part of the weekend for me was just the drive to Vegas. Ramona slept through it, and Joe and I were able to just talk for a couple hours for the first time in a long time. The opposite schedules we keep to accommodate our little girl leave us with little time together, so the opportunity to just talk and hang out made us happy. All in all, I think the weekend was one of the best in a long time, but I think the trip to San Diego will be even better. I love going somewhere I've never been, and I love being around people who make me happy, so the combination of the two has me desperately counting down the days until we go. Come on July! The day Ramona was born felt very surreal. It felt like it wasn't really happening to me. I almost felt like a passive observer at times, despite the pain and pushing, and when she started to cry for the first time I was almost confused. She's a real baby? Oh yeah. 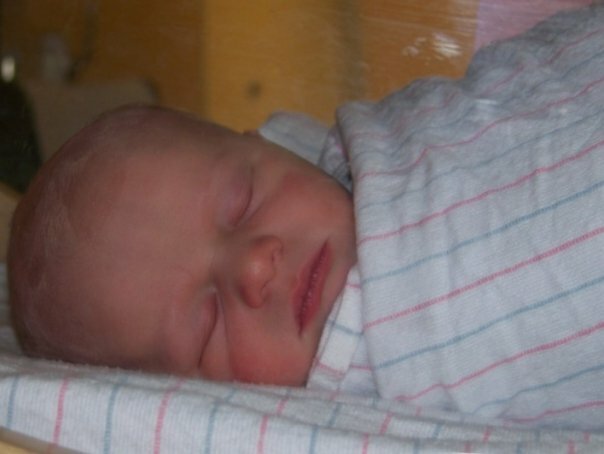 That first night Ramona spent in the world I barely slept. I couldn't stop looking at her. I was afraid I would forget what she looked like if I didn't look at her. I couldn't wrap my head around the idea that this beautiful little person was the same one who had grown inside me. I was holding her that night and she got the hiccups. It was strange and familiar at the same time. I'd felt her hiccups when she was in my belly so many times. Then I was feeling those same hiccups against the outside of my belly. I watched her little chest rise and fall. It occurred to me that she was now an independent living organism. Keeping that little chest rising and falling was my job from now on. A few weeks later, I was struck by her humanity again. She was in just a diaper and I just finished nursing her. I pulled her up and she slept with her chest on my chest. I could feel her tiny heart beating against me. I thought about how amazing, strong, and healthy, but fragile she was at the same time. Tonight was another night I couldn't stop looking at her while she slept. I kept watching her breathe. Her little lips opened up as she sighed in her sleep. She is mine to love and protect. Her chest still rises and falls each night. I must be doing something right. Hopefully I'll stop being overwhelmed by her mere existence sometime before it gets creepy for me to watch her sleep. Ramona has started saying mama. She in no way means it to refer to me, but I love it anyway! She is growing in every way, but my favorite is the way her socialization skills have been blossoming lately. She is getting more vocal and laughs whenever Joe or I laugh. She is so smiley and happy. She watches us when we talk and pays attention to how we interact. She loves listening to songs and dancing. And she adores her big kitty sisters. I think she wants to be a kitty. She gets super excited when I sit her on the kitty tower and Joe has caught her trying to eat cat food twice this week. Tonight I was making a sandwich and Lars and Danzig came in to beg for lunch meat and Ramona crawled in right behind them. Can I be a kitty, too? Tonight I called my mom to see about Erin being able to come out and go to San Diego with us next month. She answered the phone and said, "Oh, your grandma is here, too!" My grandma lives in Columbus, so usually if she comes up to visit there is a purpose behind it, so I asked what they were doing. I could swear she said, "We're doing some grass!" I was confused to say the least. I asked her to repeat herself. "We're doing graphs. We're making our own graphs. You know, for cross stitch?" Oh. I told her what I thought she said. "Nope, we're still old ladies." She cracks me up. But doesn't "doing some grass" totally sound like the kind of savvy lingo my mom would use (if she were to do such a thing, which I really can't imagine)? Anyway, I told her about Ramona's awesome new vocabulary word, but Erin was at work so she's supposed to let me know about her coming out here later. Oh my gosh, I almost forgot the most exciting thing to happen this week- Joe finally got rid of his car yesterday! Joe's car died last May on our way home from LA. It was revived long enough for us to get sort of stranded on the way home from Pahrump. Luckily, we live in a valley, and as the name implies, it is a downward voyage into the area, so we were able to coast home. I bought the new car in June and have been bugging Joe to get rid of the old car ever since (the transmission was messed up on it and it would cost more than it was worth to fix.) He assured me he would get rid of it before the baby was born. She'll be eight months next week and he finally got rid of it. I've been harassing him about it forever, and it's so good to see it gone. Finally, here's a video of me and little fish watching The Wonder Pets. (I'm sure everyone thinks all we do is watch TV because of these videos, but I assure you, we do other things as well. It's just the TV watching videos are ready to go as is, and all the other ones I want to edit and play with first.) Anyway, this is one of us dancing together while we watch.